Meet Your Neighbor Verne Stoller of Stronghurst. He will turn 92 on October 23. Verne has been a resident of Oak Wood Estates since January and is very happy to be a part of the family there. He was born and raised in Eureka and attended Eureka High School. During his life time he has been a farmer and truck driver and enjoyed both very much. He also spent 3 1/2 years in the Coast Guard stationed at Pearl Harbor. The war broke out in December and he was at Pearl Harbor the following May for two years. Between he and his brother one had to go to the military and he volunteered so his brother could stay home and farm the family farm. He remembers when he was about 21 years of age he worked at a canning factory for .35 per hour which helped him pay for his 1941 Ford car. Verne said, "It was a 2 door because everyone said if you bought a 4 door it might rattle"! He owns a farm 7 1/2 miles north of Burlington where his granddaughter and grandson-in-life presently live. 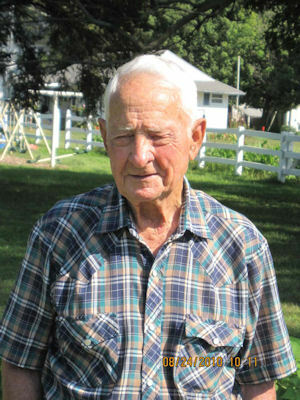 He bought the farm in 1956. He was born and raised in Eureka where he attended public schools. His parents were Anna and George Stoller. They had 6 sons and 3 daughters and Vern is the sole survivor of his brothers and sisters. He married his bride, Wilma, they were married for 60 years. Wilma was the head cook at the Iowa Army Ordinance Plant in Middletown, Iowa, for 7 to 8 years. She used to tell Vern it was so hot in the kitchen and dining room that she would open the window to get fresh air but the air coming through the windows was so terrible that she had to shut them immediately. Wilma died of cancer in 2005. Vern has tried for 5 years to get her records, even hired an attorney to help him, while employed at the plant but has not been able to. He was told they were sent from Denver, Colorado, to Cleveland, Ohio, but were either lost or destroyed during that time. He was told to get new records but Verne said, "There was no where to get new records, especially when the other ones could not be located". Vern asks, "If anyone knew Wilma while at the plant, either as someone who worked with her or someone who would have known her to please contact him." He can be reached at Oakwood Estates at 309-924-1910. He and Wilma have one living daughter, Sandra Kay (Dave) Schaer who live across the road from his farm in rural Burlington, Iowa. Dave does the farming and also does construction. Sandy helps with their grandchildren. Dave and Sandy have two daughters, Jacquelyn (Terry) Goodpastor and their children Gideon (3) and Felicity (1). Another daughter, Jessica (Kyle) Klees live in rural Stronghurst. They are expecting their first child. Jessica is a CNA at Oak Lane or Oak Wood and she and her husband both farm. Vern has a beautiful garden that he works on daily at Oak Wood. He plants tomatoes, eggplant, peppers, acorn squash, watermelons, green beans and a variety of other plants. He picks them for use in the kitchen at Oak Wood. Besides gardening he enjoys fishing baseball, the Cub and the Burlington Bees and also loved farming and truckin'! He is a 50 year member of the Apostolic Christian Church in Oakville, Iowa.